A million may not be enough! An assortment of six- and twelve-point sockets in various sizes. Note the deep-well versions in the rear. The most basic home toolkit consists of a hammer, pliers and a bent table knife. Bump it up a notch and the owner probably replaces the knife with a couple of screwdrivers and tosses in a tape measure. Add the cordless drill the kids got you for Father’s Day (or, if you’re a modern woman, Mother’s Day) and you pretty much have the utility drawer filled. If you’re serious about this do-it-yourself thing, however, you’d better have sockets and a wrench. This is a good start: a set of ten common sizes and a ratcheting handle (plus something to keep the sockets in line). 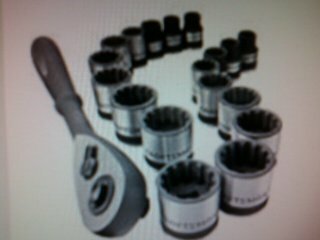 You don’t buy a “socket wrench”: you buy a set. That’s because every job requires at least two parts, a socket and a handle. The socket part is a shiny metal cylinder, one end of which fits tightly onto a nut or bolt. The other end has a square hole that marries to a square projection on a handle. You need both: you need the handle’s leverage to turn a bolt or nut, but the handle won’t fit onto the hexagonal (or occasionally square) nut. Since there are lots of sizes of bolts and nuts, sockets come in a wide range of sizes and configurations. Not only that, but the handle systems also come in different drive sizes, from ¼-inch drive for light duty to ½-inch drive for heavy work. Impact sets (not considered here) also come in 3/4 and one-inch drive. The most common drive size for DIY-ers is a 3/8-inch drive hand tool set. A ratcheting handle is at the heart of almost every set. This device is a handle about eight inches long with an oversized head containing a square drive set at right angles to the handle. The square drive fits into the back end of the socket, providing leverage for loosening and tightening nuts and bolts. The oversized head contains a gear that can be locked in either direction, which lets the handle rotate free when you turn it in the opposite direction. This allows you to fit the works onto a nut and continue to tighten or loosen it without ever removing it, even in tight quarters. A ratchet head has a lever or switch that allows you to select the rotation direction. A more advanced set will include a breaker bar as well as a ratchet. The breaker bar is longer, which allows you to apply greater torque to loosen a bolt. Unlike the ratchet, it doesn’t contain a gear – this makes it stronger; capable of withstanding force that might damage the internal mechanisms of a ratchet. Most also have a hole at the end of the handle to accept a cross bar or even a screwdriver handle, turning the works into a T-handle wrench. In other words, the breaker bar acts like a super-long extension. A breaker bar provides added torque and toughness for heavy-duty work and badly-stuck nuts. Your best bet is to start with an SAE set, unless you expect to work on a European or Asian car. Once you have a starter set, you can pick up another set in the other system or fill in gaps as you find you need them. The good news is that the ratchet handle and the accessories don’t care whether you’re working in metric or SAE. Sockets are relatively inexpensive when compared to a ratcheting handle. A 3/8-inch drive metric set will range from about 5mm to 19mm; an SAE set will run from about 1/4” to 3/4” (pretty much the same range). Quarter-inch drive sets start and end smaller; half-inch drive sets start and stop larger – up to 1-1/2” sockets, usually. These ranges will – usually – fit most nuts and bolts you encounter. A set should also contain an extension that plugs onto the drive handle, making a big L to extend your reach. Many 3/8-drive sets also include adapters that let a handle drive 1/4-inch and occasionally 1/2-inch sockets. Here's a good, DIY-quality basic set from the folks at Sears. Guaranteed for life, no questions asked. A ratchet and several deep-well sockets. The longer version acts as an extension and also lets you reach nuts that are an inch or more from the end of a bolt. After the standard starter set, the next step is to add deep-well versions. These are two or even three times as long as a standard version. They provide additional reach, but more importantly allow removal even when a bolt projects an inch or more beyond the nut. Deep-well sockets also come in six- and twelve-point designs and metric or SAE; they are often sold in sets as well. This small set (also available in metric sizes) features large, easy-to-read etched size markings for your mechanically-inclined friend who always forgets his glasses. A ratchet and sockets – regular and deep well – are just the beginning of a full set. Consider also adding a range of extension from two to ten inches and adapters to fit the next larger and/or smaller sizes. On top of those, consider articulating universal joints, “double-jointed” adapters that let you grab onto hard-to-reach nuts. Some high-end sets include articulating sockets in a range of sizes, which improve on the U-joint with a better fit and more compact design. Besides nuts and bolts, a good set also drives hex-head and Torx (six-pointed star) screws. You can easily find a set of hex and/or Torx drivers that will fit onto your choice of drive size. 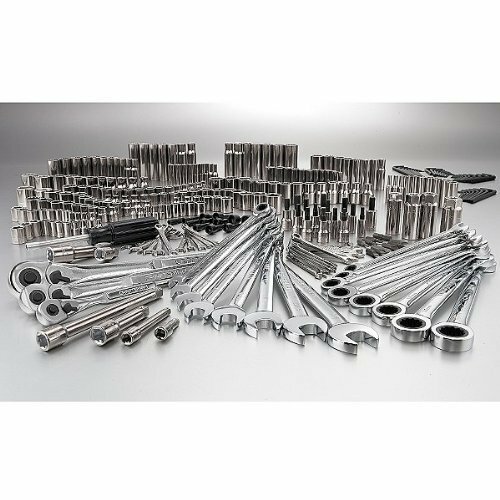 Some really large sets include crowfoot wrenches, which are versions of open-end wrenches you can fit onto the ratchet or breaker bar. Once you’ve started building a set, one important consideration is storage. Even a basic set runs to twenty or more individual pieces, and larger sets easily reach 100. 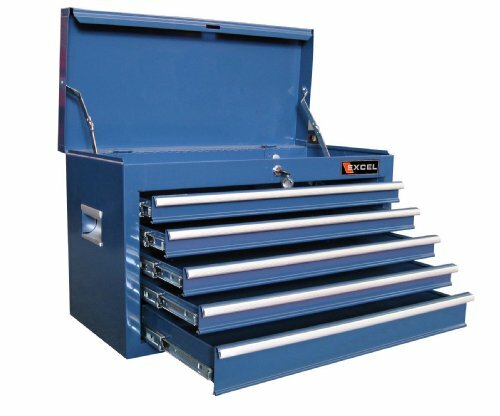 A toolbox or other storage becomes essential, especially when you’re looking for something small. It’s also a good idea to keep the two systems separated so that you don’t get frustrated trying to fit a 10mm socket on a 3/8-inch nut (or vice versa). ...something to keep it in! Socket sets, wrenches, pliers, screwdrivers - you name it, there's room in a tool chest. Look for one with ball-bearing drawer glides and a lock. Around the holidays you’ll find mechanic’s tool sets with something like 7,000 pieces at a “bargain” price. Sure, the price looks good, but you’re probably paying for dozens of pieces that you’ll never use. Instead of buying a set that has all three drive sizes and dozens of little parts in it, look for a starter set that contains the basics: a ratchet handle, standard and deep-well sockets, an extension or two and perhaps an adapter. Instead of quantity, you are wise to concentrate on quality. The parts should be high-quality steel, chrome-plated to prevent rust. Labels on the parts should be large and easy to read, and preferably molded or etched instead of stamped (stamped sizes is a dead giveaway that the item is soft steel and cheaply made). Chances are Dad will never use most of the parts in this gazillion-piece mechanic's tool set. On the other hand, he probably won't have to buy any more accessories for a while! Would 309 Pieces Make You Happy? In tools, you almost always get what you pay for: cheap stuff doesn’t hold up under heavy use, and there's nothing more frustrating than having to stop in the middle of a job, go to the store, and buy a (better-quality) replacement!